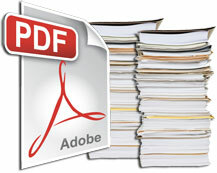 A summary of the water management and use studies completed in Phase 2 is provided in Section 6.0 (798Kb PDF). See also Key Findings, or Section 19.0 of the Summary Report. Figure 3 - Distribution of total water use in the Okanagan Basin by source (1996 - 2006). A total of 443,000 MLMegalitre. One ML = 1,000,000 litres, i.e. 1 dam3 of water is licensed for withdrawal from surface sources for human use in the BasinLand area from which water drains towards a common point. Of this total, 163,000 MLMegalitre. One ML = 1,000,000 litres, i.e. 1 dam3 is supported by storage. GroundwaterWater existing below the ground surface in aquifers use does not require a licence. 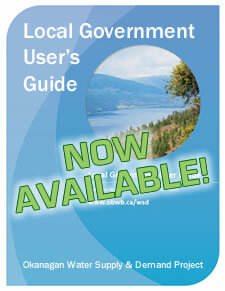 Although there are over 4,000 licences to store or use surface waterWater that flows in streams and rivers, and exists in natural lakes, wetlands, and in reservoirsArtificial lakes used to store water in the BasinLand area from which water drains towards a common point, about 95% of the withdrawal licences – by volume – are held by 57 of the largest water suppliers. 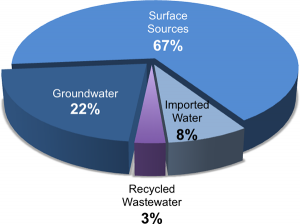 Actual average annual water useVolume or rate of water diverted or withdrawn from a water body (eg a stream, lake, or groundwaterWater existing below the ground surface in aquifers aquiferAn underground formation that stores groundwater) for use by humans on the land surface. Actual water use is determined through direct measurement. Water demand is an estimate of actual water use. in the BasinLand area from which water drains towards a common point is 219,000 MLMegalitre. One ML = 1,000,000 litres, i.e. 1 dam3, derived from several sources (Figure 3). The distribution of water used in the BasinLand area from which water drains towards a common point is shown in Figure 4. 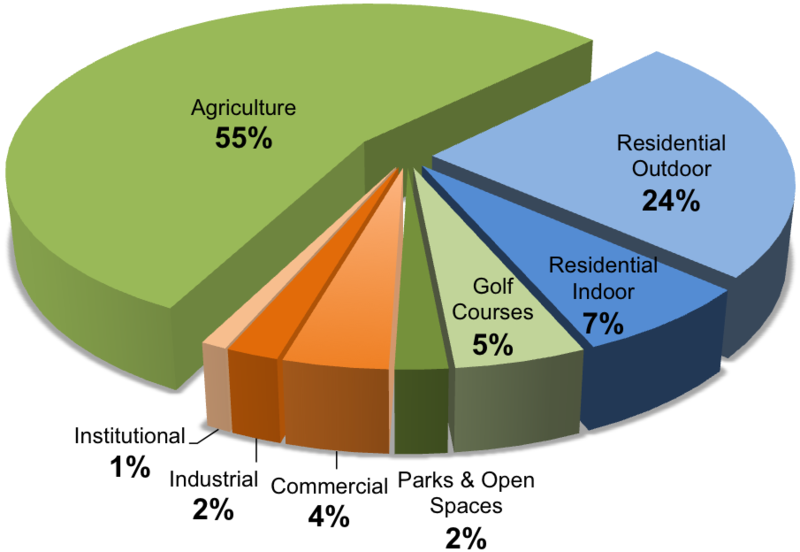 Indoor residential water useVolume or rate of water diverted or withdrawn from a water body (eg a stream, lake, or groundwaterWater existing below the ground surface in aquifers aquiferAn underground formation that stores groundwater) for use by humans on the land surface. Actual water use is determined through direct measurement. Water demand is an estimate of actual water use. averages 150 LLitre. There are 1,000 L in a cubic metre, and 1,000,000 L in a cubic decameter (dam3). 1,000,000 L = 1 ML/person per day. 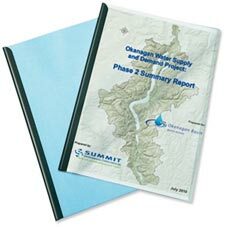 Outdoor residential water useVolume or rate of water diverted or withdrawn from a water body (eg a stream, lake, or groundwaterWater existing below the ground surface in aquifers aquiferAn underground formation that stores groundwater) for use by humans on the land surface. Actual water use is determined through direct measurement. Water demand is an estimate of actual water use. averages 525 LLitre. There are 1,000 L in a cubic metre, and 1,000,000 L in a cubic decameter (dam3). 1,000,000 L = 1 ML/person per day year-round, i.e. more than 1,000 LLitre. There are 1,000 L in a cubic metre, and 1,000,000 L in a cubic decameter (dam3). 1,000,000 L = 1 ML/person per day during summer. It is recommended that water suppliers measure and report their water extractions, and measure the water delivered to end-users. 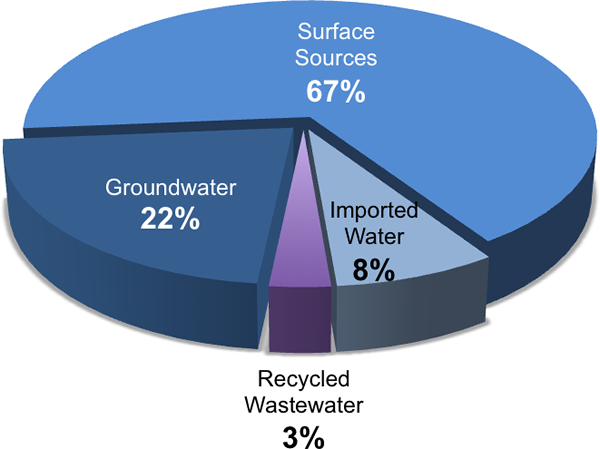 It is recommended that water conservation measures in all water useVolume or rate of water diverted or withdrawn from a water body (eg a stream, lake, or groundwaterWater existing below the ground surface in aquifers aquiferAn underground formation that stores groundwater) for use by humans on the land surface. Actual water use is determined through direct measurement. Water demand is an estimate of actual water use. sectors continue to be expanded and adopted throughout the BasinLand area from which water drains towards a common point, and that water suppliers should preserve their opportunities to expand storage in upland reservoirsArtificial lakes used to store water.